42.60€ Bottle 75 cl Tax incl. This Gran Reserva is the result of a very carefully selected from the best grapes and bunches selection to obtain a wine with outstanding potential that keeps all its aroma and splendor. Used grapes are Tempranillo, Graciano 85% 10% and Mazuelo 5%, manually harvested in boxes of 15kg. vineyards whose average age is over 45 years of age. Depending on the year, it will be a full or partial Destemming depending on your need. The wine has been fermented in French conical wooden tubs “Allier” for 13 days at a temperature ranging between 25 ° and 30 ° C, while remaining in the presence of the skins 28 days more, obtaining noble tannins, giving us a long-lived persistence color on our entire range of wines. The overpumping are 2 to 3 times daily, and the clarified with periodic racking. The wine is aged in new barrels of French and American oak for a minimum of 30 months, then staying at least 40 months resting in our racks. 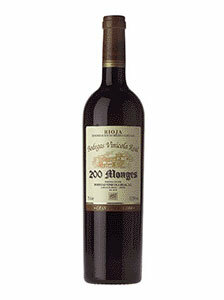 He is recommended to uncork and decant 30 minutes earlier, to appreciate its total aromatic potential to the full. It is bottled in the absence of any type of filtration.